Stampin' Up ideas and supplies from Vicky at Crafting Clare's Paper Moments: Six stamps for the price of one! Six stamps for the price of one! Before we start, this isn't the In Stitches wheel (it's the whimsy wheel) but I just wanted to show what a jumbo wheel looks like! The wheel clicks in and out of the handle and when you take it out, you can find the seam quite easily. And if you slip the point of a sharp craft knife under the rubber at the seam, you can gently ease the rubber off the wheel. Now, if you try this at home, I can't emphasise enough that you have to be very careful and very gentle! You don't want to stretch or tear the rubber. Once the rubber's off the wheel, you can mount it onto foam mount and cut each stitch apart with craft and rubber scissors. They will then cling beautifully to an acrylic block. I used Stampin' Up's block measuring 14.9cm long which wasn't quite long enough, so I just trimmed the ends off the stitches. If I want them to be longer than they are, I can just line them up with my stamp-a-majig. So - the jumbo wheel costs £8.50 and I now have six stamps for the price of one! How about that for a bargain?! Look how cute these fabulous leaf stitches look with one of the little flowers from the Itty Bitty Shapes punch pack! By angling the stems in, it looks as if you're lying in the garden, looking up at the sky (one of my favourite positions!) I've used Confetti card stock again - I love this stuff! - and the little flecks remind me of little flying creatures buzzing about among the flowers! And just look at those flowers! I love this little punch and can see that it's going to get a lot of use in my craft room! (Actually it's more of a craft desk but there it is...!) I couldn't resist adding this butterfly cut with the Beautiful Wings Embosslits die - yes, I'm still obsessed with butterflies! 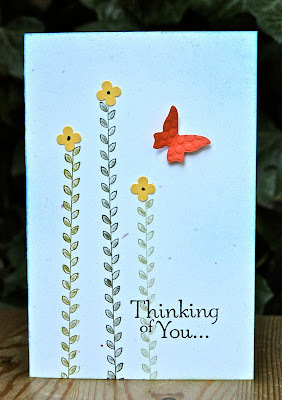 This gorgeous sentiment is from the Hopeful Thoughts stamp set - a real favourite of mine. Cut a 14.5cm x 19.5cm piece of Confetti White card stock. Score and fold it in half to make a card base. Press the acrylic block down onto the leaf stitch stamp and ink it up with an Always Artichoke ink. TIP: When a stamp is bigger than the ink pad, turn it upside down and take the ink pad to it. Stamp a stem onto the card front. Stamp off to clean your stamp and ink it up again, this time with Certainly Celery ink. Stamp a much shorter stem to the right of the first. Stamp a mid height stem in Old Olive ink to the left of the first. Colour the leaves using a blender pen and the three green inks. Punch three flowers from Daffodil Delight card stock, using the four petalled flower from the Itty Bitty Shapes punch pack. Glue these to the tops of the stems and add centres with a Basic Black marker. Add a sentiment in Basic Black, using a stamp-a-majig to make sure it's straight. Sponge Bashful Blue ink all over the card, especially at the edges. Add a little Certainly Celery ink towards the bottom. Finish the card with an Embosslits butterfly in Tangerine Tango, attached with a glue dot. I'm so excited about my brand new stamp set and I can't wait to have a play with them all! What's the betting tomorrow's Three Minute Thursday will feature some stitching?!! Do come back tomorrow and find out! Vicky, I have not seen that wheel but you are so clever to cut it up and use it in singles! I love your sweet card! I've "whacked" an embossing folder but never thought about whacking a wheel! If it's offered in again here in the States, I'm gong to have to get one and try this. It makes beautiful stems! Thanks for sharing! Brilliant idea - six for the price of one!! It must be a bit worrying doing this - don't want to damage the stamps. BTW - Love the card - the stitching really does make a great stem! Very pretty! Such a quick & simple but effective card Vicky! Love this idea of cutting up the stitches wheel! Oh my gosh that is SOOOOOO clever! I love those patterns on the wheel but had thought I wouldn't want to use them all together - now I know how to do that!!! Thanks very much for sharing the tip. The whacked wheels fit perfectly in the DVD case w/ the set too. All of my wheels have been removed from the wheel; think I can get 9 in one DVD case. I cut that wheel in 1/2 so I would have 3 stitches on each pieces. Sometimes I cant get one strip straight enough so I figured I could ink up either side when I need it. I may end up cutting it in 6 pieces later on. Clever you what a pity I can't get SU in Greece ! Fabulously clever and beautiful work. I took all of my wheel stamps apart about a year ago, and I find that I use them a lot more now. Great idea! I've never gotten into the wheels, but what you have done is so inventive, I love it! I'm not really called Crafting Clare of course - that's just a nickname given to me by my naughty teenage daughter because of my passion for crafting! I'm proud to have represented the UK on Stampin' Up's Artisan Design Team 2014-2015 as well as being a UK independent Stampin' Up demonstrator 2010-2015. Although this blog is no longer updated I hope that you will enjoy browsing for inspiration. Welcome! This is my personal blog and is not endorsed by Stampin' Up. I hope you'll find inspiration here but please don't copy my designs for publication or contest submission.